Springtime in a Small Town is Tian Zhuangzhuang’s first film in nearly a decade and it tells the story of a young woman who falls in love (again) with her sick landowner-husband’s college friend. Zhang Zhichen (Xin Bajqing) blows into town to visit Dai Liyan (Wu Jun) and discovers that his ailing friend is married to his childhood sweetheart Yu Wen (Hu Jingfan). 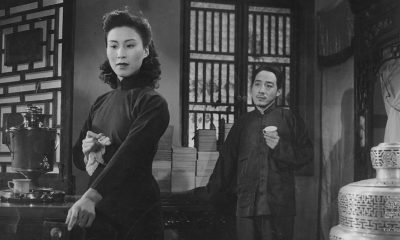 Liyan suggests that Zhichen wait two years and marry his 16-year-old sister Dai Xiu (Lu Sisi), but Liyan’s sickness encourages Liyan and Dai Liyan to rekindle their age-old affections. As shot by long-time Hou Hsiao-hsien collaborator Mark Li Ping-bing, Springtime in a Small Town moves like a Hou film though it’s never as penetrating as Goodbye South Goodbye or Good Men, Good Women. The film’s landscapes evoke the demystifying horrors of the war; indeed, the river ride the four main characters make through the countryside must count as one of the most subversive scenes of the year. Tian emphasizes the isolation of these characters by confining color to Liyan’s backyard. It is there that the sickly young man seemingly draws his breath from a weakened Mother Nature. The film exudes a sense of fleetingness; however static these lives may be, Tian’s narrative perfectly evokes a changing season. Zhichen says that Liyan will get better yet there’s an overwhelming feeling that Zhichen will leave town and nothing will change for Liyan and his family. At least not until next season.